Don't just sit there thinking "Universal Studios Hollywood?" I've been there and done that. Everything that’s going on at Universal Studios Hollywood these days is enough to get any theme park lover excited. If it's been more than two years since you went there last, it's time to go again. This summary will catch you up on new additions and closings - and give you a preview of what to expect. The newly reimagined and re-engineered Jurassic World Ride will probably open in late spring or early summer of 2019. Universal describes it as having "never-before-seen dinosaurs, enhanced storytelling, lush scenic design, an entirely new color scheme and uncompromised state-of the art technology." Universal is developing a new Super Nintendo World in Tokyo, which is due to open in 2020. After the opening date is announced, expect to hear more about Nintendo attractions in California. In the summer of 2018, the newly built DreamWorks Theatre opened. Its first show os a technologically-advanced attraction based on DreamWorks' Kung Fu Panda. Called "Kung Fu Panda: The Emperor’s Quest,” it's designed to engulf guests in an experience that goes far beyond those tired 3-D glasses. New technologies promise a 180-degree, fully immersive adventure. The theatre's ultra-plush, fully articulated seats are not only comfy enough that they won't distract you from the action, but they also pivot and swivel in tandem with the action. In the Wizarding World of Harry Potter, two new wand spells brought the total to 15. You can conjure flames with the Incendio fire-making spell or use the Alohomora spell to unlock a series of intricate locks that may reveal the fiery breath of a creature hidden behind a secret door. And even if you don't have a wand to wave, you’re guaranteed to get a compliment when you walk past Madam Malkin's Talking Mirror in the corridor between Dervish and Banges™ and Gladrags Wizardwear. Universal thinks they have a good thing with butterbeer - and they’re probably right when the drink is viewed from an income-producing perspective. And if you’ve got a good thing, why not expand on it? New additions in 2018 included Butterbeer fudge, ice cream and potted cream. All of them (but especially the fudge) may be too sweet for your taste. “The Nighttime Lights at Hogwarts Castle” returned for a limited time. The awe-inspiring light show showcases the four houses of Hogwarts and ends with beams of lights that fan into the night sky. The Jurassic World ride closed on September 3, 2018, to be transformed into the next-generation “Jurassic World Ride,” a reimagined telling of the ground-breaking adventure. Features will include the introduction of never-before-seen dinosaurs. It's not a ride, but Hello Kitty-themed merchandise arrived at Universal and Hello Kitty herself show sup to greet guests. Universal also partnered with Netflix to bring Stranger Things to life during Halloween Horror Nights. The big new thing in 2017 was the spectacular night show "The Nighttime Lights at Hogwarts Castle," which was shown during the holiday season and made a brief return in late March, 2018. If this show is on when you go, don't leave without seeing it. In 2017, Universal also hosted its first-ever New Years Eve night in the park. 2016 was a huge year, with the opening of the Wizarding World of Harry Potter in April. Get all the details in the profile of Wizarding World. Universal also built a new parking structure to hold all the extra visitors - and a new freeway ramp to help them get there. And they introduced a new fleet of studio tour trams with ultra-comfy cushioned seats. 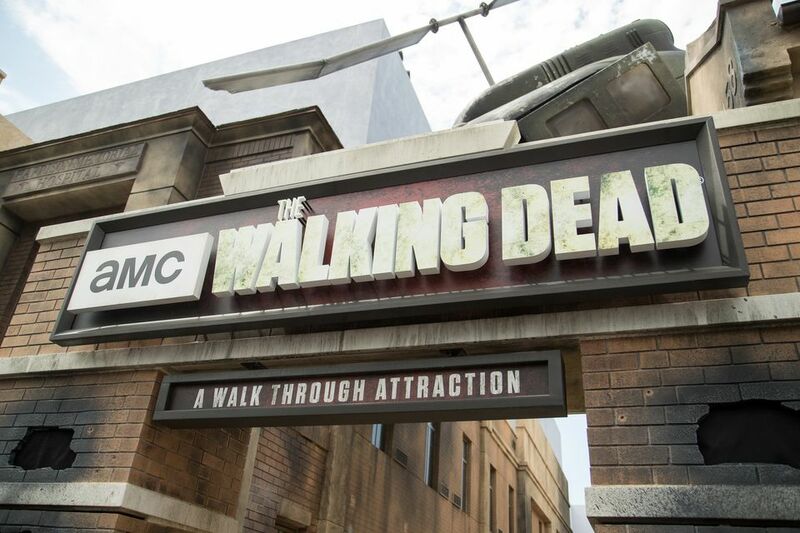 Ending the year like a super-charged overperformer, they added a walk-through attraction called The Walking Dead based on The Walking Dead television show. Also important is that these new additions made it nearly impossible to do everything at Universal Studios Hollywood in a single day. If you're going, expect to spend two full days there. And think about paying extra for Universal Express passes or you'll be spending all your time waiting. 2015: The new “Springfield” may make you feel like you were hurled through the television set and into the Simpsons' cartoon town. On the backlot, the new Fast & Furious stop is a 3-D wrap around experience that make visitors feel like they’re being pulled through the streets at more than 100 miles per hour. And there's a new Nighttime Studio Tour. House of Horrors closed permanently. 2014: Despicable Me Minion Mayhem - Gru and his adorable minions moved into the former Terminator 2 space, and Super Silly Funland opened next door. House of Horrors closed permanently after Halloween to make room for a new dining area. 2012: Transformers™: The Ride-3D - This ride is in the lower lot, where the old Backdraft and Special Effects stages were. Special Effects moved up to the Upper Lot. 2010: King Kong 360 3-D - Replacing the King Kong Encounter which was destroyed in a fire. House of Horrors: closed and replaced by The Walking Dead attraction.